The FSU Meteorology Department was founded in 1948, making it one of the oldest meteorology programs in the nation. On Earth Day, April 22, 2010, the Departments of Geological Sciences, Oceanography, and Meteorology merged to form the Department of Earth, Ocean & Atmospheric Science (EOAS). This merger was an administrative move that had no effect on any of the degree programs in meteorology. FSU offers the most extensive undergraduate and graduate programs in meteorology of any university in the southeastern United States. Current enrollments in meteorology are roughly 150 undergraduate students and 80 graduate students. International students are drawn to both the undergraduate and graduate programs. 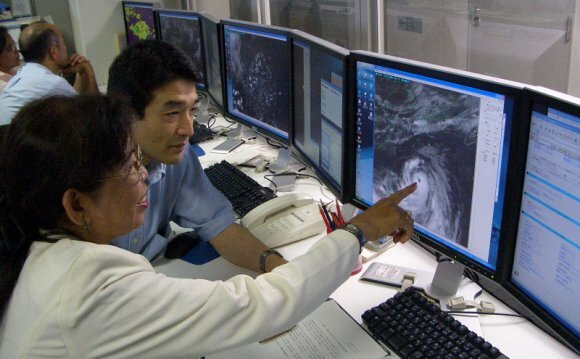 The faculty pursues research in diverse areas of dynamical, physical and synoptic meteorology and climatology. Members of the department benefit from cooperative research interests involving meteorology and oceanography, the Center for Ocean-Atmosphere Prediction Studies (COAPS), the Geophysical Fluid Dynamics Institute, and the Departments of Mathematics and Computational Science. The Tallahassee Office of the National Weather Service is located in the same building with the meteorology program. Our computing facilities provide access to meteorological data and numerical forecasts using the full suite of meteorological software developed by UNIDATA ( in two computer lab rooms. In addition, the department houses the office of the State Climatologist of Florida and the Florida Climate Center ( The department also maintains an atmospheric instrumentation laboratory to support education and research and a well-equipped broadcast studio for students interested in weathercasting. This TV studio is also the site for live weekday evening weather broadcasts over FSU’s cable television station to surrounding counties. Nearly all of our meteorology undergraduates pursue the Bachelor of Science (B.S.) degree rather than a Bachelor of Arts (B.A.) degree, which requires 9 additional humanities and history credits; fro details, search “Bachelor of Arts” in the FSU’s college catalog titled the General Bulletin ( All well-prepared students will have some room for elective coursework, but students planning to major in meteorology must arrange their programs carefully, starting with their freshman year. Prospective meteorology majors who enter FSU as freshmen or transfer students should be counseled by a department faculty or staff advisor from the beginning. Students who enroll elsewhere and plan to transfer to FSU at a later date are advised to study this material closely. The preferred time to transfer to FSU is the fall of one’s junior year. The Meteorology area also offers students the ability to learn weathercasting. Many prominent weathercasters on the air today have been students in our weathercasting program. Stephanie Abrams of the Weather Channel and Janice Huff, Chief Meteorolgist in New York City are just two examples. Follow the link to learn more about weathercasting at FSU.